The sunrise was gorgeous yesterday morning through the pine trees in my backyard. Before going out to take pictures I thought it might be nice to grab this hat to keep the sun out of my eyes. There are pictures somewhere in my moms house of me at age 5 with my teddy bear running around the woods while I'm wearing this exact chapeau. Just slightly moth eaten and a little misshapen, it still makes my mom go Awww, whenever I take it out of the closet. It didn't work out to keep me from squinting, but the warm sunlight felt wonderful on my skin. 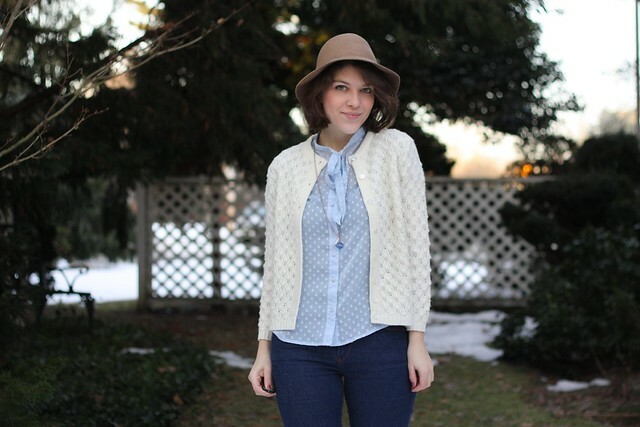 Powder blue is popping up all over in spring collections, so its a good thing I snagged this lovely blouse from H&M during their winter sale for $10. Its the perfect shade of sheer sky blue that I think looks lovely with jeans. Yea, the jeans, which hardly ever come out to play made an appearance. Casual Friday has me hooked and fiending for more, after a long week its so nice to sit unladylike in my desk chair while I work while dreaming about the huge beer that awaits me afterwards. I'm not sure if anyone's told you, but you remind me so much of Alexa Chung. :)) Except cuter! 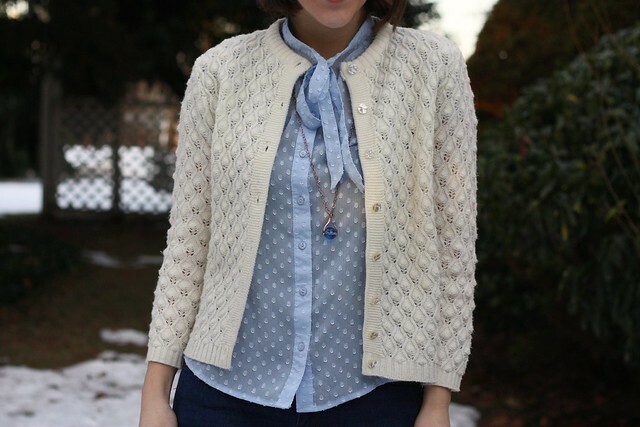 I love the mix of textures for the cardi and the blouse. Saving for inspiration! I really love this outfit. It's so sweet. The necklace you hace is really beautiful by the way. Ooo, I looooove H&M sales! That blouse is beautiful and it looks perfect with that pretty cardigan! That hat was a great find, also - it pulls the whole outfit together. Lovely lovely pictures! 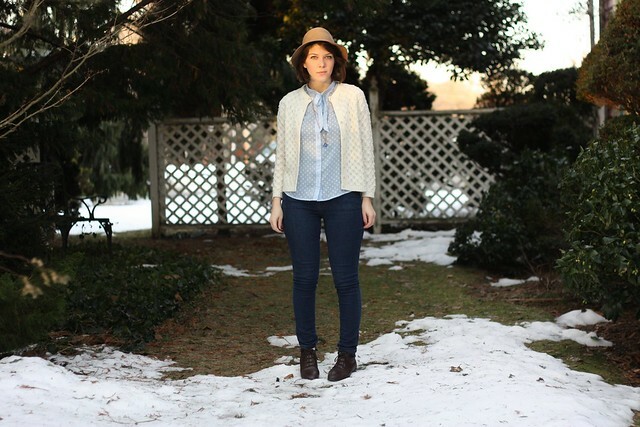 Love this outfit post of yours and the photos are just gorgeous! DSLR's are really better than point and shoots for outfit shots. Very pretty textures and soft colors. Very nice look. your outfit is supercute too, I'm into the simplicity and prettiness. 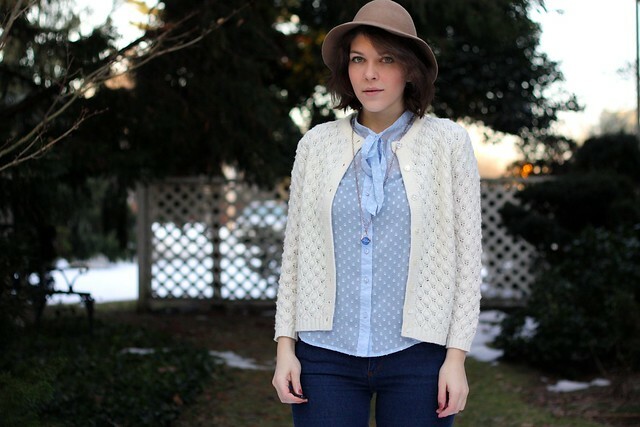 I love your hat, and the powder blue blouse is perfect with the jeans and for this time of year. Casual Friday is the best! I get it every other week, and it's such a nice way to end the work week. I love the addition of the hat - it's totally making the outfit for me. Ok so I read Annebeth's comment and was like YES. THAT'S WHO SHE LOOKS LIKE. You totally look like Alexa Chung but even prettier. I looove this color blue on you. Plus that hat & that nifty cardigan- so chic. I reeeally love the second to last photo. Oh and I totally relate to the 'sitting unladylike in office chair dreaming of beer' part. I don't often wear jeans but Fridays are probably when I wear them the most... and Friday beers are THE BEST! this is so pretty with a touch of childhood innocnece. love the soft lighting of morning and the charm of the hat. the sheer blouse is just lovely. the hat and cardigan are adorable! you look gorgeous!! i love that top with the cardigan! =D your necklace is pretty too! No one else could wear this blue top like you ! My dearest Kallie, sorry I've been away for so long but I had so much work..
Now I came here and I read your post about that girl the other night and I just can't believe someone would ever say that to you like that! I'm really sad that you had to live that moment and I hope you are better now. Gosh, I don't even know what to say more. I remember when you shared your family history here in the blog and the holocaust escape..well, that just proves even more the supidity of people in judging others based on the skin color. Why do people stereotype or divide others into groups? religious, ethnic, wathever, is just stupid. We all come from the same place, and we are all humans and I feel really sad to read that there still are people like that girl. You look very cute! The picture is taken at the right spot. Such a lovely outfit! I love the hat with the cardigan. It just gives the look a sort of unexpected boost. don't I say it? here I go again post this on tumblr, haha! love the blouse! i've been obsessed with these bow tops....what a steal! not only is the color great, but it has dots, too!